Hundreds of ancestral languages have gone silent in recent generations, taking with them the culture, knowledge and traditions of the people who spoke them. 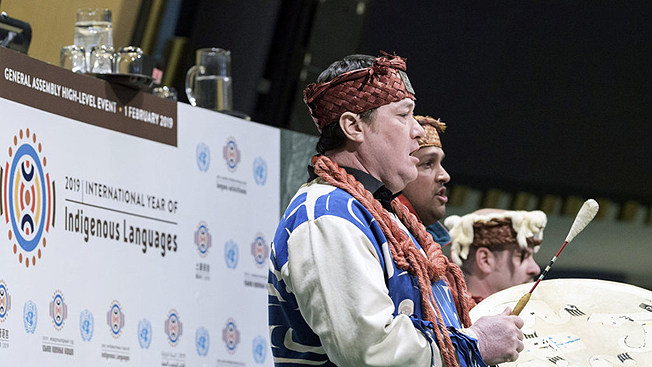 To preserve and revitalize those that remain, the United Nations on Friday officially launched the International Year of Indigenous Languages, at UN Headquarters in New York. Delivering inaugural remarks, Kanen’tó:kon Hemlock, a Mohawk community Bear Clan Chief from Kahnawà:ke, paid tribute to Mother Earth. For his part, Evo Morales, President of Bolivia, addressed the survival of indigenous people and languages under the force of colonialization. Mr. Morales called on those present to work together through dialogue to promote policies which help to preserve Indigenous lives, identities, values and cultures. There are 770 million Indigenous people across 90 countries, constituting six per cent of the global population, living in many biodiverse regions, the President noted. And yet “capitalist greed” has left them among the poorest 15 per cent of the population, he stated. Encouraging everyone to “preserve the knowledge and wisdom of our ancestors”, Mr. Morales urged that a new paradigm be ushered in, one which is the fruit of indigenous peoples and “champions the Mother Earth”.